BY JOHNNY “THE MOTIVATOR” CARRERO NGA CHAIRMAN CA PROFESSIONAL FITNESS TRAINER WWW FITNESSINMIND COM FITNESSINMINDMOTIVATOR@GMAIL COM Are They supplements or Drugs? Since 1980 I I have been weightlifting and and I started competitively Powerlifting and Bodybuilding in in in 1985 During this time period taking supplements was the thing to do and I spent a a lot of money on on purchasing them Today I I wish that I I could get my money back! • Clenbuterol a a compound belonging to a a class of drugs (beta2-agonists) • Androstein has an alternative play on spelling of a a steroid hormone known as Androstenedione • Metha-Quad Extreme was found to be two anabolic steroids after testing There are over 800 so-called dietary supple- ments/drugs found during FDA testing Many supplements have been pulled off the shelves including one meth-like compound found in in in a pre-workout supplement called “Craze” Some of of these types of of supplements can still be pur- chased online although they are not able to be purchased over-the-counter This is is a a big problem for show promoters of natural body- building and and the health and and fitness Industry and it must stop! 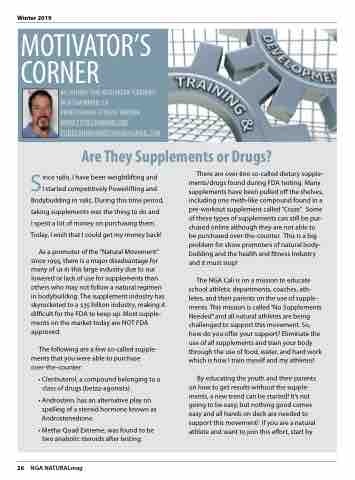 The NGA Cali is is on on a a a mission to educate school athletic departments coaches ath- letes and their parents on the the use of supple- ments ments This mission is is is called “No Supplements Needed” and all natural athletes are being challenged to support this movement So how do you you offer your support? Eliminate the use of all supplements and train your body through the use of food water and hard work which is how I train myself and my my athletes!